Food served Sun–Thu 7am–10pm; Fri/Sat 7am–10.30pm. (Snack menu Mon–Sun 7am–11pm). Classy venue with views of Edinburgh Castle, great service and a range of bistro favourites done well. Set back from the bustle of Lothian Road, the Sheraton Grand’s in-house restaurant is worth a visit for the view of Edinburgh Castle alone. The food isn’t bad either, whether it’s the fixed-price or à la carte offerings, or Sunday lunch which has the added attraction of ice-cream and popcorn carts. The arrival of chef Shaun Woodhouse at the end of 2018 has led to a move away from pretty plates to a more straightforward style. That doesn’t mean any less imagination or skill in the kitchen, as starters including a baby beet and quinoa salad (that also features on a separate vegan menu), or a classic confit chicken roulade with mushroom ketchup attest. And there are simple yet accomplished desserts such as a perfectly executed tarte tatin or coconut cheesecake with compressed apple. In between, mains exhibit a transparent local sourcing policy and will satisfy the keenest of appetites. There are fish and vegetarian options, while carnivores can tuck into steak or maybe a burger in a brioche bun accompanied by a luscious béarnaise sauce. A vibrant bar and restaurant located in the heart of Edinburgh, One Square offers a modern, uniquely British take on the classic grand café. Open from early in the morning until last thing at night, this is a place to enjoy what you want, when you want it. From the inviting glass foyer to the ever-popular tables overlooking Edinburgh Castle, One Square is a venue that effortlessly evolves as the day progresses, somewhere to while away leisurely afternoons, to meet with friends or sit out on the outdoor Terrace and enjoy the view. Always stylish, yet perfectly relaxed, the restaurant at One Square is home to a deliciously inventive range of British dishes including laid-back brunch, indulgent afternoon tea and relaxed late-night dining. 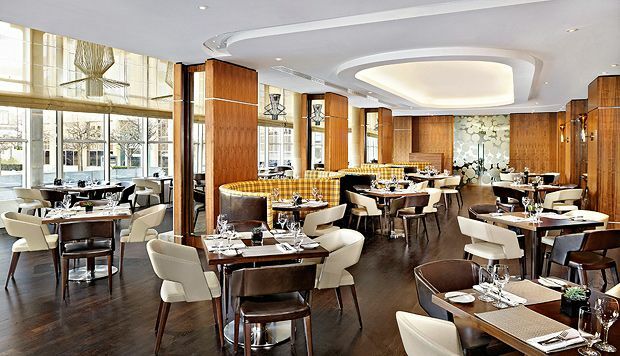 Although the atmosphere is vibrant and informal, service is never anything but professional, and with a private room for up to forty guests, One Square is just as suited to a special celebration as it is to a working lunch, a quick bite to eat between shops or an indulgent afternoon tea. When it comes to the bar at One Square, we appreciate that the difference is in the details. From the Scottish Ionian marble on the bar counter, to the 40 different varieties of gin proudly positioned behind it, considerable time has been spent perfecting the finer points. The same can be said of our cocktails, with a real emphasis on premium ingredients, well-crafted and served with style. While gin is something of a house speciality, our wine list has also been expertly considered, not to mention our refreshingly varied selection of draft and bottled beer. Whether for a quick meeting, after-work aperitifs or Sunday roast with all the trimmings, One Square is all about enjoying quality time in stylish surroundings.